Each and every Sunday, you will find a new Guest here. I have booked some really AWESOME bloggers (and non-bloggers as well), from all over the internet, and I just can’t wait for you to “meet” them all. Thank you for stopping by today to join us for this week’s "The Guest". Hi! I'm a former Kindergarten teacher turned stay at home mom who loves music, trips to Disney world, shopping, nights out with my hubby or girlfriends and just being a mom to two adorable and funny girls! After quitting my teaching job to move with my family to Florida, I needed a new hobby since I found myself binge watching way too much tv once the girls were asleep (although OITNB is totally worth a binge watch!). Why not start a blog? Never having blogged before, I had NO idea what I was getting myself into but I've found that I really love it. My little shopping blog has evolved into more of a lifestyle blog where you'll find posts about everything from what it's really like to be a SAHM to how we bought a fixer upper and completely renovated it. 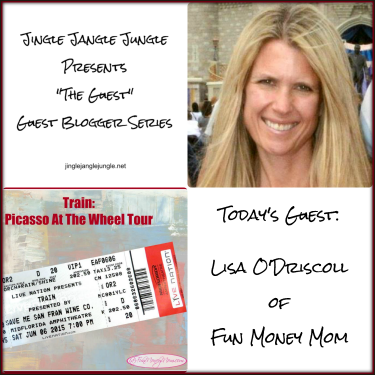 I'm excited to be a part of the Jingle Jangle Jungle Guest Series and hope you enjoy reading my post as much as I enjoyed writing it! Jimmy Buffet – Get there EARLY for this one because half the fun is the tailgate in the parking lot. By the time the concert starts, you'll be drinking buddies with everyone around you! This is also the one concert where you don't have to splurge for the expensive seats because it's just as much fun on the lawn as in the front row. Bon Jovi – This guy really knows how to put on a show! It doesn't hurt that he's pretty easy on the eyes, too! I love seeing him in concert because he is so entertaining on stage and performs his heart out. Plus, who doesn't love to sing along to Livin' On A Prayer? Neil Diamond – Slowing it down a little, this is a completely different type of performance from Bon Jovi. However, once he starts singing, you will be amazed at how many hit songs he has. He's also personable, funny and interacts with the audience, something that always makes a concert more enjoyable for me. Black Eye Peas – I'll let you in on a little secret...I really want to be Fergie in my next life. I've always felt that I should be a rock star, except for that tiny little problem of my not being able to sing on key...at all! My friend and I saw their show a couple years ago and both agree that it was one of our favorites. It was so high energy from start to finish that you couldn't help but have a blast! Train – I'm saving the best for last! If you don't like Train to start, you can just skip through this part (although how can you NOT like Train?). If you do enjoy their music, you definitely won't want to miss them in concert. I just saw this show last week and it's always one of my favorites! Pat Monahan is an awesome performer and knows how to give the audience exactly what they want! He's playful with the fun songs and soulful with the ballads and as the band is playing, you start to realize that you know every song. He'll throw a curveball sometimes and this time he sang a cover of “Dream On” by Aerosmith...let me just say that he nailed every last note! If you've been to any of these concerts, I'd love to know if you enjoyed them as much as I did! I'd also love to hear about some of your own favorite shows.